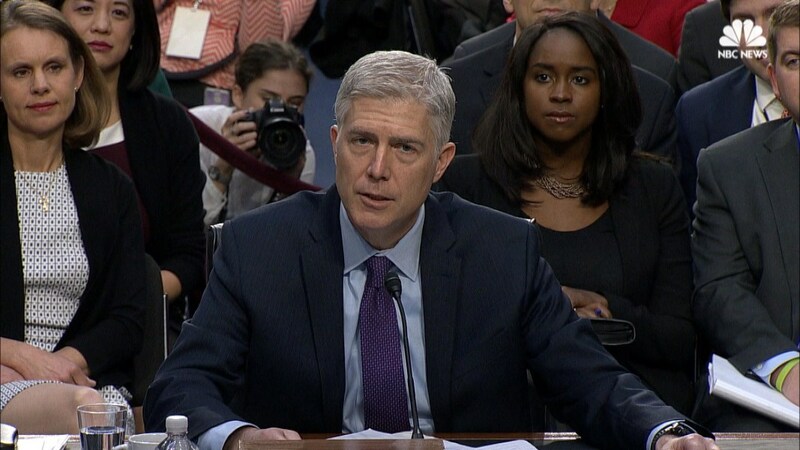 Neil Gorsuch insisted that he would not shy from ruling against President Donald Trump and assured lawmakers during the second day of his confirmation hearings Tuesday that he made no commitments to the president when he was nominated to the Supreme Court. Gorsuch said he would have “no problem” ruling against President Trump or anyone else. The 10th Circuit Court of Appeals judge said he would have “walked out” if Trump asked him to vote against Roe v. Wade. He called it “grossly improper” to speculate about how he would rule in case about travel ban. “There is no such thing as a Republican judge, or Democratic judge. We just have judges in this country,” he added. Gorsuch has used the start to his high-profile confirmation battle to present himself as a consensus building, independent jurist with views well within the mainstream. He repeatedly told members of the Senate Judiciary Committee he made no promises to the Trump administration about future rulings, even saying he would have “walked out the door” if Trump asked him to commit to voting against Roe v. Wade, the landmark 1973 Supreme Court ruling that affirmed a woman’s right to an abortion. But Democrats prodding him about his opinions on both established Supreme Court precedent and the legality of Trump’s most controversial acts thus far as president, including Trump’s travel bans, received few clues. The 10th Circuit Court of Appeals judge called it “irresponsible” to tip his hand on potential future rulings. “It would be grossly improper of a judge to do that and a violation of the separation of powers and judicial independence if someone sitting at this table, in order to get confirmed, had to make promises or commitments about how they’d rule in a case that’s currently pending and likely to make its way to the Supreme Court,” Gorsuch said after Sen. Patrick Leahy, D-Vt., examined him about Trump’s controversial travel restrictions. Trump’s revised executive order banning travel from six Muslim-majority nations, issued after his first travel order was described as a “Muslim ban” by critics and met with significant legal challenges, was blocked from going into effect by a federal judge last week. Gorsuch called Roe v. Wade “precedent” that has been “reaffirmed many times” and declined to say whether he agreed with a host of other precedent-setting rulings on issues like gun rights and the power of the executive branch. “If I indicate my agreement or disagreement with the past precedent of the United States Supreme Court, I’m doing two things that worry me sitting here: The first thing I’m doing is signaling to future litigants that I can’t be a fair judge in their case. Because those issues keep coming up,” Gorsuch told Sen. Dianne Feinstein of California, the highest ranking Democrat on the committee. 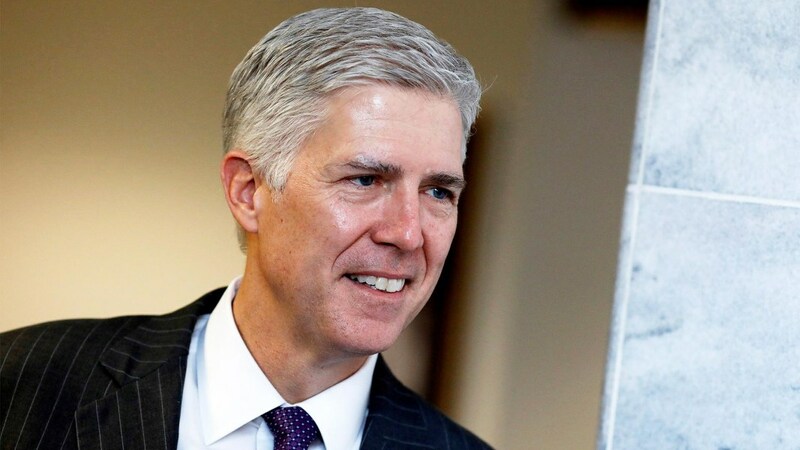 Democrats and liberal groups have attacked Gorsuch for his ties to big business, centering on his skepticism of the so-called Chevron Doctrine that allows federal agencies to make rules to clarify areas where the law is ambiguous. His opposition to Chevron could curtail federal agencies ability to tackle issues like climate change and workers’ rights. Feinstein asked the nominee for assurances “that you will be for the little man” and stand up to corporate interests. “If you want cases where I ruled for the little guy as well as the big guy, there are plenty of those, Senator,” he told Feinstein, who asked for examples to be sent to her office. Democrats also used the hearing to voice their frustrations over Republican efforts to block Merrick Garland, President Obama’s pick to fill the court vacancy left after Justice Antonin Scalia’s death in February 2016. 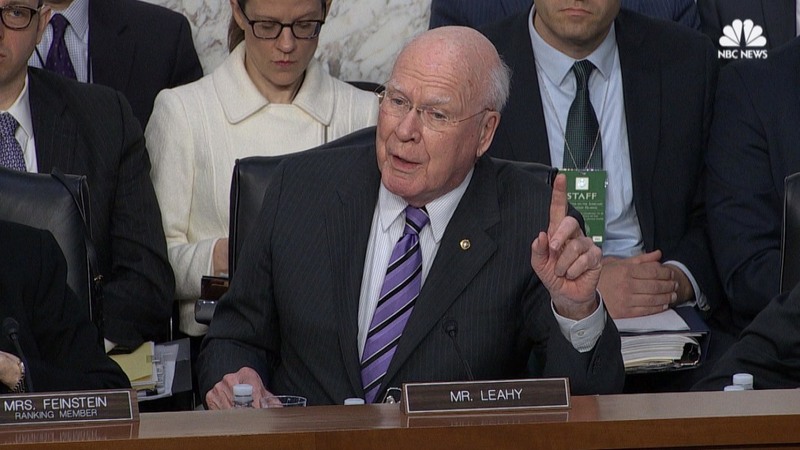 “Do you think [Garland] was treated fairly by this committee, yes or no?” Leahy asked Gorsuch. “I can’t get involved in politics, and there is judicial canons that prevent me from doing that,” Gorsuch said. Scalia’s death — and Republicans’ subsequent refusal to allow President Barack Obama to fill the seat, made the Supreme Court one of the top issues in the 2016 race. Trump won 56 percent of voters who said the nominee was important, according to national exit polls. Outside groups are pushing Democrats to unite in opposition to Trump’s pick, though most have said they will wait for the hearings to conclude before deciding how they’ll vote. Senate Minority Leader Chuck Schumer, D-N.Y., has painted Gorsuch as an ideological extremist and said he will make his views “very strongly known to them” once the public hearings conclude. Outside groups have also been working to promote Gorsuch’s confirmation with millions of dollars in undisclosed donations. Sen. Sheldon Whitehouse, D-R.I., asked if it was “any cause of concern” for him that a reported $10 million ad campaign was launched to support his nomination. “There is a lot about the confirmation process today that I regret,” Gorsuch said, including the strain it has put on his family. “The fact of the matter is, that it is what it is, and it’s this body that makes the laws. And if you wish to have more disclosure, pass a law and a judge will enforce it,” he added. Even a united front would unlikely be enough for Democrats to stop Gorsuch. Senate Majority Leader Mitch McConnell, R-Ky., has not ruled out invoking the so-called “nuclear option,” a parliamentary maneuver that would eliminate the 60-vote threshold required to advance a nominee, and intends to approve the nominee before the Senate breaks for Easter recess.